It’s that time of the month, foodie pen pal reveal day. I’m usually on top of things by writing my post early and then scheduling it. This month I was not as good. Actually I’m sitting down and writing it on our reveal day. Oh, well! It’s been a busy week and I’ve rarely been home long enough to write anything. This month I sent to Ilona who lives in New Jersey. This is the second time I’ve sent to New Jersey. To see what Ohio goodies I sent to her, visit her blog Ilona’s Kitchen. Seaweed snack – I’ve wanted to try it but never was brave. I still haven’t tried it but will in the near future. We are going on vacation in the near future so these will be good to take with us. I need to get some pretzels to dip in this. The Imaginative One’s favorite drink. I love lo mein so this will be good for a night I make Chinese food. This will be great for breakfast. We had this the night I received the box. The whole family enjoyed the rice dish. I have these in the freezer but haven’t eaten any yet. Maybe soon. If you’re from the US or Canada and are in participating for July, please CLICK HERE (www.theleangreenbean.com/foodie-penpals/) to fill out the participation form and read the terms and conditions. Cut the sausage into rings. In a bowl, mix the sauerkraut, brown sugar, and Dijon mustard together. Place sausage and sauerkraut into the crockpot. 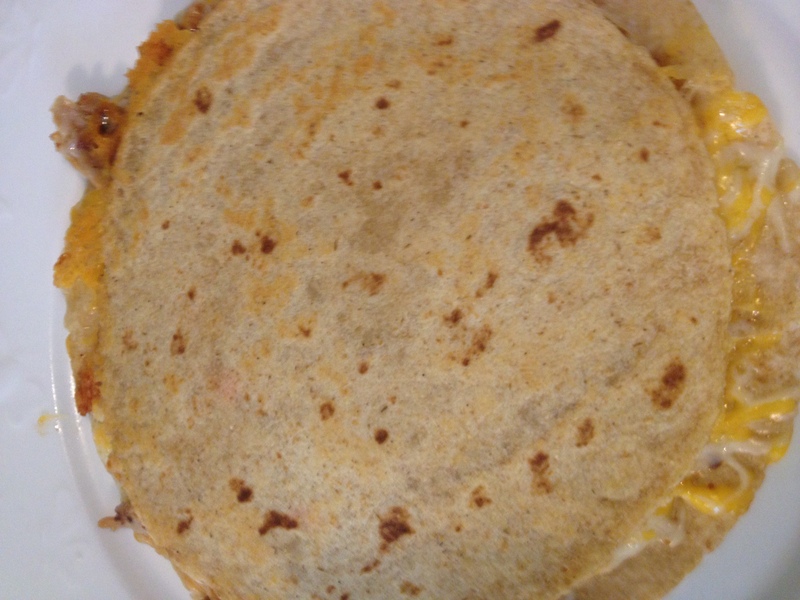 I have made these quesadillas a bunch of times and easy time Hubby is impressed with them. Since I had some leftover chicken from the bbq chicken sandwiches, I decided to make these quesadillas. Once again, Hubby raved about them. The boys ate plain cheese or cheese with bacon bits quesadillas instead of these delicious quesadillas. Oh well, it’s their loss! Warm up a skillet or griddle pan over medium heat. Spray the warmed skillet or griddle pan with cooking spray. Place a tortilla in the skillet or griddle pan. 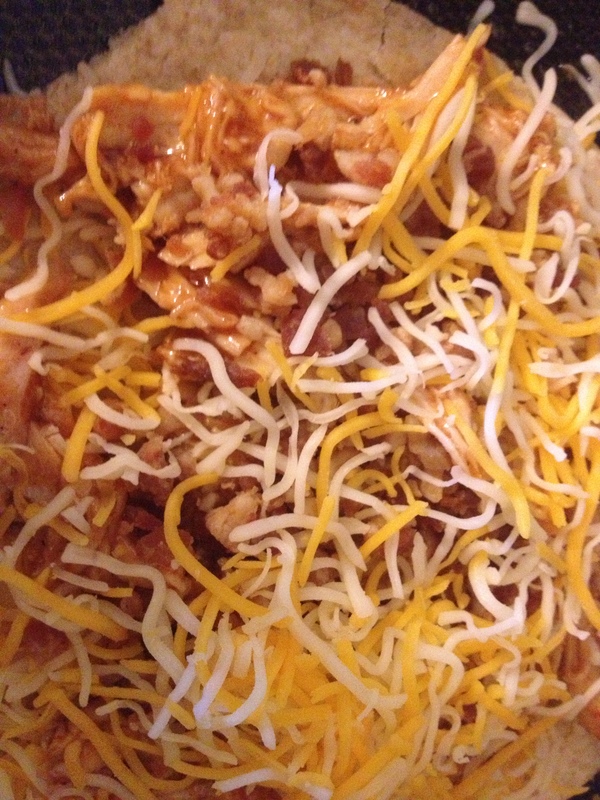 Sprinkle (in this order) cheese, chicken, bacon bits, and then more cheese onto the tortilla. Flip over and then cook until the other side is browned. Place on a plate and enjoy with ranch dressing. My favorite ranch dressing is Bolthouse Farms’ Classic Ranch. Here’s what it looks like after you sprinkle on the goodies but before you add the second tortilla. On Saturday, I got a rotisserie chicken at Sam’s Club. We ate it for dinner on Saturday evening. Since we had some left over, I needed to figure out what I could make with it. I decided to make BBQ chicken sandwiches. 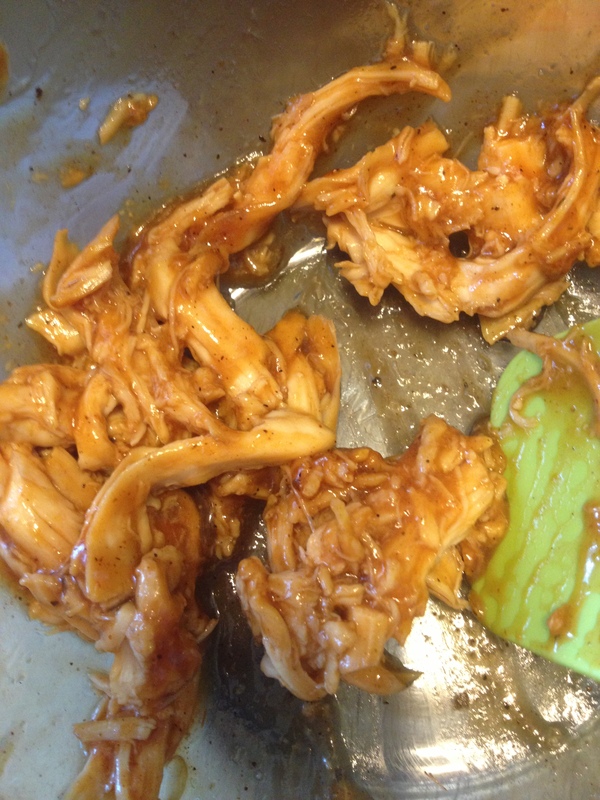 Shred up the left over chicken and onions if using them. Place in a medium sized pot. Cover the chicken with the bbq sauce. Cook over medium heat until the chicken is warmed up. Enjoy on a bun with cheese and maybe some lettuce! I had another cooking blog on website. I’m going to transfer some of the posts from there. Enjoy! I served mine with green beans and biscuits with apple butter. This smoothie looked interesting so I decided to try it. At first, I was skeptical because it contained carrot juice but it ended up being delicious! It’s a wonderful way to get fruits and veggies you need! If you want to you, you could add nonfat Greek yogurt for added protein. I haven’t tried it yet but I bet it would be delicious. Put all of the ingredients in your blender. Blend away until desired consistency. If need be, add water if it doesn’t blend. This is our family’s favorite ice cream that my in-laws make. They only make it for special occasions At the end of the school year, my mother-in-law contacts my sons’ teachers and asks if they mind her bringing some of the ice cream to share with their classmates. It is a way for them to celebrate their birthdays because they both have summer birthdays. Warning: You do need to have an ice cream machine to make this. 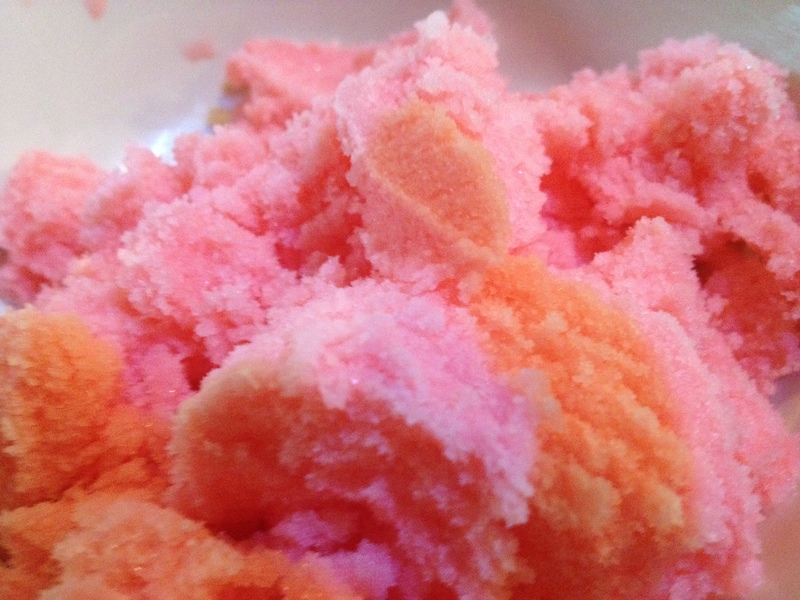 Combine the cream soda and sweetened condensed milk in the ice cream machine. Follow the instructions for your machine. Put in a freezer safe container in your freezer.